Relevance of the programme (evaluation question 1): do the different objectives of the programme (in the Regulation and in its work programmes) correspond to the needs of the national tax administrations, economic operators and citizens? Effectiveness of the programme (evaluation question 2): to what extent has the programme reinforced cooperation and improved information-sharing between tax authorities of participating countries? Effectiveness of the programme (evaluation question 3): To what extent have economic operators used and benefited from the programme? Effectiveness of the programme (evaluation question 4): To what extent has the programme contributed to the achievement of its specific objectives? Efficiency (evaluation question 5): To what extent have the design and management of the programme been conducive to achieving the desired results? Efficiency (evaluation question 6): To what extent have the programme's resources produced best possible results at the lowest possible costs? Coherence (evaluation question 7): To what extent does the programme demonstrate internal and external coherence? EU-added value (evaluation question 8): To what extent does the programme provide EU added value? The Fiscalis 2020 multiannual action programme is one of the principal measures to support the implementation of European Union taxation policy. It provides a framework to improve the proper functioning of the taxation systems in the single market through enhanced cooperation between participating countries, their tax authorities and officials. The 34 participating countries are made up of the 28 EU Member States and 6 candidate and potential candidate countries 1 . Building on prior initiatives entitled Matthaeus-Tax (established in 1993) there have been successive editions of the programme: the first Fiscalis programme (1998-2002), the second Fiscalis programme (2003-2007), the third Fiscalis programme (2008-2013) and the current Fiscalis programme (2014-2020). The ensuing sub-sections briefly describe the underlying context and the programme itself. The Fiscalis 2020 programme was set up by Regulation (EU) No 1286/2013 of the European Parliament and of the Council of 11 December 2013 establishing an action programme to improve the operation of taxation systems in the European Union 2 . In compliance with Article 17(1)(2) of the Regulation, the Commission, assisted by an independent external evaluator, carried out the mid-term evaluation of the programme. The purpose of the mid-term evaluation was to assess the programme’s performance since its start on 1st of January 2014 up to the half-way of the programme’s implementation. The temporal scope of the evaluation runs from the programme’s establishment until the end of 2017, depending on the availability of relevant data. In compliance with Article 17(2) of the Regulation, the mid-term evaluation sought to shed light on the (1) achievement of the objectives and programme's performance so far; (2) strengths, weaknesses and value for money of the different activities supported; (3) continued relevance of the programme for the tax administrations; (4) coherence and synergies with other EU policies and priorities and; (5) value added thanks to acting at the EU level. Moreover, the evaluation examined (6) how well the Performance Measurement Framework (PMF) that was put in place to monitor the programme in 2014 has delivered on its objectives, and (7) the implementation and follow-up of recommendations made for previous evaluations. For accountability and learning purposes, the evaluation provided recommendations for future improvement of the programme’s functioning. The evaluation took into account the programme’s full range of funded and management activities, all the relevant stakeholders (national administrations, the Commission services and economic operators) and covered all participating countries (including candidate and potential candidate countries). The present evaluation staff working document is based on the findings and conclusions presented in the supporting external study (see: Annex 1 for organisational details). The Commission appreciates the overall quality of the external study and acknowledges the methodological difficulties and efforts undertaken to mitigate them. The findings are deemed robust and the conclusions accurately drawn. Figure 1 presents the main features of the Fiscalis 2020 programme in terms of its objectives, supported activities, beneficiaries and overall financial envelope. The intervention logic underpinning the evaluation is presented in Annex 3. Altogether, 34 national tax administrations take part in the programme’s activities. The Commission manages the Fiscalis 2020 programme centrally through direct management with assistance from the Programme Coordination Group (responsible for Commission internal coordination) and the Fiscalis 2020 Committee (responsible for the external coordination with the national administrations). The Fiscalis 2020 Committee 3 is composed of delegates from each participating country. The Programme Coordination Group assists among others in identifying policy priorities for the Annual Work Programmes, reinforcing coherence between the programme objectives and priorities of the European Commission, monitoring of the programme’s performance and increasing the overall transparency and dissemination of information. The Fiscalis 2020 programme builds upon previous versions of the programme and as such has been in place for over 25 years. It allows for a coherent implementation of EU law in the field of taxation in light of current challenges by securing the exchange of information and supporting administrative cooperation and enhancing the administrative capacity of tax authorities. In fact, the programme has been around too long for most stakeholders to meaningfully consider the situation before it started. The IT systems, constituting approximately 75% of the programme’s available funds, have long been engrained in the national and EU taxation landscapes. In line with the Commission’s commitment to monitor the EU budget and ensure the accountability for value for money, to facilitate this task the European Commission has developed a framework for monitoring the outputs and results of the programme – the Performance Measurement Framework. It is a results-based monitoring system containing an intervention logic, adjustable indicators, data collection schemes and reporting arrangements. This framework became operational in 2014, following recommendations of earlier evaluations to provide more and better data to assess programme implementation and performance. Whereas it does already facilitate performance management, the framework is still too fresh to provide insightful benchmarks for the programme’s performance or establish and examine trends. Nevertheless, whatever comparisons could have been drawn across the years of the programme's operations are included in the analysis. The Commission reports on the implementation and performance of the programme annually, through the Annual Progress Reports. To date, reports for 2014 to 2017 are available. The overview of the programme’s implementation presented here is based on the latest available report 4 . Due to the programme’s design and objectives, the vast majority of funding goes into the development and operation of the IT systems, followed by the organisation of the joint actions, studies and training activities. The numbers of participants in the Fiscalis 2020 programme’s joint actions remains at a high constant level, above 4200 participations/year, as demonstrated in Figure 2 and Figure 3 below. The small dip in 2014 is due to the programming as Fiscalis 2020 became operational only in April 2014 following a transition from the previous version of the programme. Source: Fiscalis Progress Reports 2014-2017 5 . Note that data on participation in expert teams was not available. Project groups represent by far the largest number of instances of participation of taxation officials in the programme. This is mainly due to the repeated nature of these types of joint actions, where individuals who participate often attend several meetings over time, sometimes lasting for the whole funding period. In comparison, the nature of other joint actions, such as working visits, is that they typically involve just a few officials. Workshops and multilateral controls also register a high number of instances of participation, due to both a high number of actions (especially for multilateral controls) and many instances of participation per action. The Commission monitors regularly the awareness levels of the programme and its potential amongst tax officials. Raising this awareness is considered vital in fulfilling the programme's objectives. Every 18 months the Commission runs the Programme Poll measuring the extent of familiarity with the programme and networking levels. It is distributed in all tax administrations of the participating countries, inviting both participants and non-participants to the programme's activities to take part. The second measurement conducted in January 2017 registered an increase in the levels of awareness of the programme among tax officials from 54% in 2014 to 59% in 2016. Despite the increase, the results are below the 2011 baseline (66%) and the target (>75%). The launch of a new communication strategy for the programme in 2016 is expected to positively impact the level of awareness. The overall approach to the mid-term evaluation can be classified as theory-based evaluation. It implies examination of the causal mechanisms in which the programme was expected to generate the desired results and impacts through collection of evidence to test the initial theory. Such approach allows to confirm (or not) the supposed causality and understand how and why these mechanisms led to expected or observed results. In doing so, the evaluation seeks to identify and assess the extent to which external factors might have hindered or supported the process. The evaluation work built on three distinct pillars: (1) overall programme assessment focusing on the programme as a whole in terms of its implementation and performance, (2) thematic case studies probing into specific agreed topics for in-depth qualitative research, and (3) engagement with the economic operators to gather views from the stakeholders who, although not direct beneficiaries of the programme, are impacted by some of its outputs, notably IT systems or eLearning modules. Taken together, these allowed the external evaluators to examine the Fiscalis 2020 programme from different angles and levels of detail, as well as engaging with different groups of stakeholders. The pillars have been sequenced so that the earlier parts could shape, inform and validate the later data collection and analysis. In the context of a cooperation programme such as Fiscalis 2020, which often plays a supportive role in implementation of EU policies and priorities, this approach seemed particularly suited. Not least due to inherent difficulties of attributing measurable results to the functioning of the programme. The intervention logic for the Fiscalis 2020 programme and details behind the data collection tools and techniques behind each pillar, are presented in Annex 3. The evaluators laid down the challenges and limitations at the start of the assignment and suggested mitigating measures where relevant. The proposed approach and methodology were chosen in such a way as to counterbalance some of the challenges. ·Nature of the programme: the programme supports a range of processes and systems. These in turn contribute to objectives at various levels, but often in indirect ways, alongside other factors such as the administrative capacity and priorities of national administrations, and prevailing economic and trading conditions. This made it difficult at outcome level and close to impossible at impact levels to attribute change to the programmes in any quantifiable way. In-depth qualitative research, especially from the case studies, allowed the evaluators to mitigate this to a certain extent by examining the likely contribution of the programme’s activities across a wide range of areas. ·Data availability and timing: the Performance Measurement Framework used for monitoring and reporting, helped to alleviate some of the monitoring weaknesses identified during previous evaluations, providing more and better data to assess programme implementation and performance (especially at activity and output levels). However, this data was also patchy in places, and was of limited usefulness at results and impact levels. The evaluators made some changes to the indicators and sources to deal with this issue. ·Reliance on samples: the large number of funded activities, the timeframe and limited resources meant the evaluators could not cover every aspect of the programme in detail. Instead, they had to rely on a relatively high-level assessment of the programme’s general features and achievements, combined with more in-depth examination of samples of Annual Work Programme projects, funded actions and stakeholders. By conducting fieldwork in a fairly large and diverse sample of countries and triangulating from several research methods, they were able to broaden the evidence base enough to make generalizable inferences with confidence. ·Stakeholder and researcher bias: the stakeholders who engaged with the evaluation all had their own priorities, leading to potential biases in the opinions and views. In-depth stakeholder analyses early in the evaluation process, a diverse evaluation team (including an expert board and with a leadership split across two companies) and a robust process for triangulating the findings served to identify such biases early in the research process and mitigate their risks. In line with the requirements of the Better Regulation Guidelines, the evaluators were to assist the Commission service in conducting a public consultation on the programme’s functioning. The original methodology was designed in such a way as to use the public consultation to elicit views and perceptions of these stakeholders who would have not been otherwise reached under the key evaluation tools, notably the economic operators, citizens and various organisations. During the preparations for the launch of the public consultation, the Commission issued central instructions to group all public consultations relating to mid-term reviews and future proposals of all of the Commission’s spending programmes and funds into one public consultation, divided in cluster of themes. As the general objective of the Fiscalis 2020 programme is to improve the proper functioning of taxation systems in the single market, the programme was included in the cluster on investment, research and innovation, SMEs and single market. The original public consultation questionnaire prepared for the mid-term evaluation of the Fiscalis 2020 was subsequently transformed into a targeted survey to economic operators. The following sub-sections sum up the main findings of the study prepared by the independent external evaluator and seek to provide an answer to the evaluation questions which have been included in the terms of reference designed by the European Commission. At root, relevance refers to the need for an initiative. In other words, if there was no Fiscalis programme, would someone need to invent it? Examining relevance is critical because if a programme is not relevant (not doing the right thing) then evaluating how well (effectively) or efficiently this is being implemented has no real value. The relevance of the programme was addressed by examining the needs of tax administrations, economic operators and citizens. Fiscalis is, at the general level, both necessary and relevant. There is a consensus among national administrations that the programme corresponds to real needs with regard both to the application of tax legislation, and to further convergence in areas such as VAT and excise duties. The major issues dealt with within the scope of the programme reflect the work and priorities of participating countries. In fact, the programme is – in some areas – so integrated and important that imagining a “world without Fiscalis” seems very difficult. Most interview respondents, with varying experience of the programme, also pointed out that Fiscalis corresponds to current issues within taxation and helps them keep up to date and informed of European developments. This corresponds to both promoting the more uniform application of EU law and to modernising working methods. Exchange of experience on a wide variety of working practices is, at the general level, highlighted by national coordinators and case study interview respondents. This exchange between tax officials, enabled by the programme, is seen as essential to support the uniform understanding and implementation of legislation, which is seen as a core aspect of the programme. As for the need to exchange information, it was hard for many respondents to consider an alternate scenario where Fiscalis did not support such exchange, as programme and national efforts are closely interwoven within several fields, e.g. excise. This can be interpreted as evidencing close alignment between national priorities and programme efforts. Looking towards the underlying need for systems for exchange of information, systems like the Mini-One-Stop-Shop can be seen to address both the necessity of efficient exchange of information for the proper functioning of the single market, and the need to create systems which reduce the resources required by administrations and the administrative burden on taxpayers. For example, case study interviews point out that the Mini-One-Stop-Shop was developed specifically to enable the implementation of new VAT legislation without creating further administrative burdens. Without such Fiscalis activity, which enabled major channels for exchange of information, including the European Information Systems, there would most certainly be a need to find corresponding solutions to address underlying needs and problems. Further, it is uncertain if such systems could in fact be implemented without a common arena for coordination, as well as a source for funding, like Fiscalis. The Annual Work Programmes covered the needs of the national administrations and allowed them to engage in relevant actions and activities. Considering the actual projects addressed, these cover a broad scope of activities and interventions. While earlier years (2014 and 2015) had more projects in total, and more projects specifically addressing concrete issues, in 2016 and 2017 actions were to a greater extent organised in broader projects covering themes rather than specific interventions. Content-wise, the projects are usually multi-annual rather than annual, as the actions and processes they cover stretch over more than one year. This is reflected in recurring projects year to year. At the same time, interviews show that the broad scope and flexibility of the Annual Work Programmes allows administrations to fit the priorities and activities which they consider necessary into the programme. Following this, the interviewees were positive of the Annual Work Programmes and programme priorities. In fact, it is noteworthy that it is not the setting of correct priorities per se, but the possibility to pick and choose within the framework of the Annual Work Programmes, based on more specific national needs, which is highlighted as a strength by several national administrations. 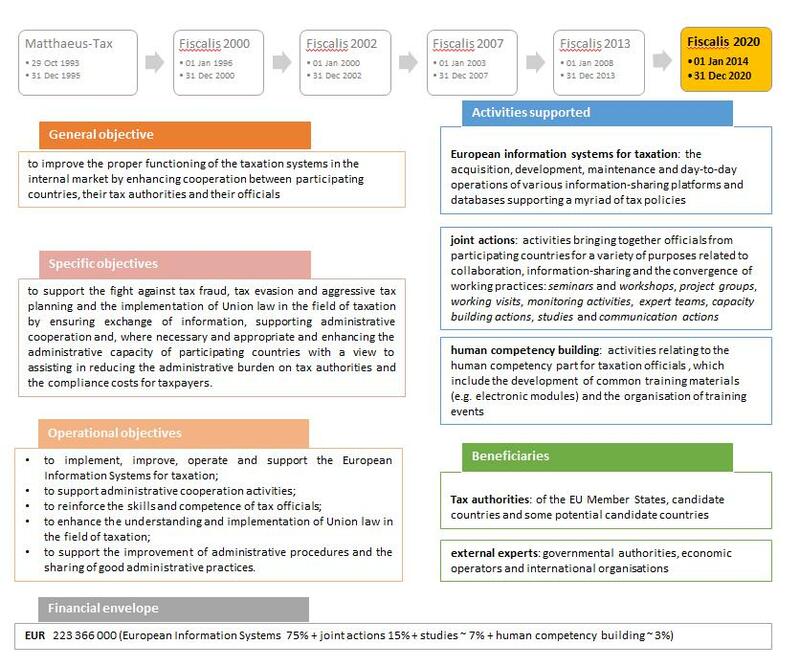 The evaluation has explored the relevance of programme activities within the three major types funded: joint actions, European Information Systems and training. The different types of activities are all potentially relevant depending on the circumstances and needs in particular cases. Overall, the relevance of programme activities is high, and it is evident that activities have developed in tandem with participating countries’ priorities and over a series of versions of the programme. The questionnaire to national administrations shows that, in general, actions for networking and exchange of ideas were valued highly due to providing opportunities to meet, discuss, learn from each other, and exchange ideas on concrete problems. Firstly, as for joint actions, case studies concerning risk management, participation in administrative enquiries, multilateral controls and IT collaboration give evidence of the differing needs these address, and the variety of intervention mechanisms. A general point from many sources is the importance of common problems among participating countries, focused exchanges on concrete practices and solutions, and the active participation of expert officials, in order for joint actions to be relevant and provide value. Secondly, regarding the work to develop and manage the European Information Systems, these are considered core to the Fiscalis programme among key interview respondents such as national coordinators and case study interviewees. Their relevance is often self-evident, as they usually provide a new solution to a perceived problem otherwise inadequately addressed or that would have to be addressed at a national level in each of the participating countries. For the third major activity type, training, the reviewed activities show differing relevance for differing participating countries, as well as depending on the specific intervention. The development of eLearning modules has not been embraced by all countries, as some show a lack of interest in new training material within the field, and some are sceptical about the eLearning format as such. While training activities are highly relevant to a sub-set of participating countries, some also noted a need to intensify the needs-uptake from both national and local administrations, as well as from other stakeholders. The uptake of, and coordination with, participating countries’ needs and priorities may be an area for improvement for the training activities in general. If taking sheer participation in the programme’s joint actions as an indication of its relevance to the national administrations, the numbers speak for themselves. As mentioned in section 3 on the state the play there have been 7721 participations in project groups, 3410 participations in workshops, 3108 participations in multilateral controls, 1002 participations in working visits, 640 participations in administrative cooperation activities, 228 participations in seminars, 219 participations in administrative enquiries, 104 participations in joint communication actions and 90 participations in capacity building and supporting actions organized across all participating countries within the programme’s first 4 years in operation 6 . Overall, the programme covers the needs of national administrations in general terms, and the objectives, priorities and activities are relevant in relation to the administrations’ requirements. Possible adjustments were mentioned by respondents within a variety of actions, e.g. increasing and / or reviewing the grants for expert teams, setting up webinars or online training on emerging tax topics, providing further support for joint collaboration on developing IT systems, and other such operational improvements. On a more strategic level, the possibility to further engage high-level national tax officials is an important area for consideration, through increased activities such as high-level seminars and meetings (e.g. further meetings for national Directors / Director-Generals). This would serve the double function of (a) increasing visibility and awareness of the programme, and (b) allowing for discussions which can serve both to focus and to anchor programme priorities, leading to an even better match between programme and national efforts. The engagement of high-level officials is at its core an issue for national administrations to address, but the programme may also play a role by supporting and prioritising initiatives and actions relevant for such officials in dialogue with national administrations. While not an unaddressed need as such, the expansion and further development of major European Information Systems is an important issue to continue to explore. Both the European Information Systems reviewed in the case studies – the Excise Movement and Control System and the Mini-One-Stop-Shop – were seen by many respondents as having further untapped potential. Especially the widening of the scope of these European Information Systems (already comprehensive solutions for their respective focus areas) was highlighted, e.g. extending the systems to cover additional product types. At the same time, the complexity of such continued development was acknowledged, as well as differing Member State priorities within common IT systems. There is also the possibility for further participation in the programme of candidate and potential candidate countries, and for actions addressing their particular needs. Candidate and potential candidate countries, while recognising and understanding that the focus of the programme is on the collaboration of Member States, emphasised the relevance and need for deepening and adapting the possibilities for their participation in the programme, and the value of this for both themselves and the EU community. While national administrations are the main beneficiaries of the Fiscalis programme, many economic operators are also involved as users of some IT systems and training modules, and sometimes as participants in specific joint actions. As simplified procedures as well as equal and predictable application of EU law can be assumed to be important for economic operators (as well as for tax administrations), there are many activities within the programme which address the underlying needs of these. Overall, the Fiscalis programme is relevant for economic operators because its priorities and activities match the underlying needs of businesses and address the concrete problems they face. Importantly, this is because the programme addresses some of the issues economic operators face related to cross-border trade, in terms of the need for smooth and efficient systems for exchange and relay of information, clear and accessible information on regulations etc., and administrative procedures and processes which do not result in unnecessary compliance costs due to complexity or lack of coordination. Despite the efforts of Fiscalis to simplify tax matters involving more than one EU Member State, respondents to the economic operator's survey considered this to be less simple than when only one country is involved, with a slight majority (24 of 43 respondents) thinking it “much less simple”. Only a few respondents thought it is as simple. Language issues, difficulty in finding the right information or different legal requirements were mentioned as factors complicating tax matters involving more than one EU Member State. This points to a need according to economic operators for action within the scope of Fiscalis. Economic operators have in turn shown interest in the tools, solutions and services supported by the programme, especially the European Information Systems, which are the natural conduit through which programme efforts come to benefit businesses. The main channel to further address the needs of economic operators thus seems to be the continued expansion and refinement of coordinated taxation schemes and systems for exchange of information. Among the general public, there is little evidence on the direct awareness or impact of the programme. Indirectly, the programme addresses problems which are highly relevant to citizens, and where EU action is considered necessary. Recent revelations in the form of the so called “Panama papers” have influenced the perceptions of citizens with regard to tax matters and have brought the topic high on the agenda. This and similar global stories of tax evasion, fraud, and aggressive tax planning (among businesses and private individuals), are a further indication of citizens’ views of the continued relevance for further international and European coordination in the field of taxation. Although they are not direct beneficiaries of programme activities, they are concerned by and have a right to be informed about the programme. In particular, the programme contributes to the lives of citizens by supporting correct and effective understanding and enforcement of tax legislation across the participating countries. Themes such as the combat of tax fraud, tax evasion and aggressive tax planning as well as ensuring the fair and equal application of tax legislation have increased in relevance in the eyes of citizens and communities. The underlying relevance of Fiscalis efforts is evidenced from a Special Eurobarometer Report of the European Parliament, on EU citizens’ perceptions and expectations regarding EU action, conducted in April 2016 7 . This shows that fighting tax fraud is a high priority in which citizens feel the EU should take further action. The issue of fighting tax fraud was ranked third among EU actions for both insufficiency of action today and desire for more intervention. 66% of respondents considered action insufficient at the time of the survey, and 75% wanted the EU to intervene more to fight tax fraud, with only 5% wanting the EU to intervene less. The Fiscalis 2020 programme is essentially about making it easier for participating countries’ tax authorities to work and share information with each other. To operate effectively within the single market, Member State tax administrations need to be able to work together, and to do this they need to be able to communicate with each other efficiently and securely. The IT systems, of which 25 are currently in operation (see Annex 4 for the full list of IT systems financed by Fiscalis), cover a range of cross-border issues relating to direct taxation and indirect taxation, as well as supporting architecture and applications. Rather than forming a coherent package, the systems have typically followed policy developments, either being set up to fit the needs of specific EU policies (often the case in indirect taxation) or to facilitate information-sharing in areas where this is required by EU legislation (often the case in direct taxation). The technical functions and EU role in developing and implementing the systems also vary, with some systems being centralised and others having EU and national components. About 75% of the Fiscalis 2020 programme goes into the operation, maintenance and development of the IT systems 8 . The Fiscalis programme supports the production of common system specifications, co-ordination of the deployment, conformance testing, monitoring of service quality, etc. The Common Communication Network/Common System Interface which is the backbone for trans-European IT systems and thus a crucial tool for administrations to be able to share information securely, was available 99.8% of the time, beating its target of 98% and showing improvement from previous years. The best indicator for the utility of the IT systems for cooperation and exchange of information is the sheer number and volume of messages exchanged. The total number of messages exchanged on the Common Communication Network/Common System Interface network in 2017 was 4.32 billion with an application traffic volume of 5.57 Terabytes in comparison to the total number of messages of 4.54 billion with a traffic volume of 5.54 Terabytes in 2016. Various tax departments use the systems relevant to their work routinely in performing their tasks and appreciate the swiftness and access to various data. The supporting architecture and applications were very favourably reviewed by the respondents contacted for the evaluation. Interviews with programme managers helped shed more light on the favourable opinion towards the Common Communication Network in particular. Given the sensitive nature of tax administrations’ work, concerns about security have traditionally acted as an important barrier on sharing information between countries. According to national coordinators, the Common Communication Network has helped to take down this barrier by dissipating such concerns and allowing Member State officials to communicate more freely and quickly with each other. Since communication would previously have required slower and more bureaucratic processes, often exchanges simply did not take place. Responses were similarly positive for a number of the systems related to indirect taxation. These included the VAT Information Exchange System (VIES), which allows the Member States to exchange information within the frame of EU VAT legislation, VIES-on-the-Web, a public system for verifying VAT numbers, the Mini One-Stop-Shop, a new system for processing VAT for certain services, the Excise Movement and Control System (EMCS), which facilitates the monitoring of excisable goods under duty suspension, VAT Refund and the System for Exchange of Excise Data (SEED). The eForms system, which assists national administration in their daily effort to exchange information electronically 9 with each other as well as the central depository in a secure and fast manner, was also perceived as very useful. A few other systems in this area, mostly either new, minor or superseded by other systems, were in less use or not widely known. The case studies allowed for a more in depth view of some of the IT systems financed by Fiscalis and thereby shed more light on success factors and ways in which they can increase collaboration and information sharing between the Member States. For example, the Excise Movement and Control System was developed during the previous Fiscalis programme and is excise's main operation application, in direct use in all Member States and accessed by over 100,000 economic operators. The evaluation case study focused on recent improvements to the system realised through the current Fiscalis programme, as well as the processes for continued support and development of additional modules. Member States unanimously viewed the system as a highly necessary and appreciated improvement compared to the previous paper-based system. Development and implementation costs of the system have been significant in several Member States, but the system was expected to lead to substantial long-term cost efficiency for national tax administrations. The value of the system for economic operators is not fully known, but generally a positive impact can be assumed as it simplifies excise dealings. Overall, the Excise Movement and Control System must be viewed as a continued success in terms of improving the excise environment in Europe. Creating a computerised solution to excise control was and is essential, and it is highly doubtful if this system could have existed (or been as successful) without EU action. The Mini-One-Stop-Shop allows companies to supply telecommunications, broadcasting and electronically supplied services within the EU without the need to be VAT registered in each country, and can be considered a flagship initiative of the Fiscalis programme. As a new system that addresses highly prioritised issues within the field of VAT information, the evaluation case study provided a chance to assess the system’s development and implementation as well as related joint actions. The specific need for such a system was apparent and undeniable as well as highly topical. Without a system like the Mini-One-Stop-Shop, there would be a significantly higher administrative burden placed on cross-border suppliers of services, especially small and medium enterprises. While already showing positive results, the vital benefits of the VAT cooperation of which this system is a “pilot” are expected to be further increased later, when its scope is widened to encompass all business-to-consumer transactions (especially physical goods, creating a broader One-Stop-Shop). For example, a previous study done in 2015 10 calculated that the administrative burden for businesses engaging in cross-border business-to-consumer supplies of telecommunications, broadcasting or electronic services would amount, on average, to an extra EUR 5 200 per each Member State to which the cross-border supplies were made. This cost is avoided when the Mini-One-Stop-Shop is used. Results for national tax administrations are overall positive, with easier access to information, possible reductions in VAT fraud, and incoming (and outgoing) VAT through the system shows it is working. There have been costs incurred by both Member States and the Commission to implement the system, which are balanced through economic benefits, as the revenues collected and redistributed through it are significant and increasing on a yearly basis (more than 3 billion EUR each year, increasing so far with approximately 12% to 15% per year). The perceptions of economic operators are not monitored by national administrations. A previous study evaluating the impact of , , the Mini-One-Stop-Shop estimated the objective of the system to achieve reduced administrative burdens and reduced costs, making it easier to operate across borders was positively assessed a. Without EU involvement, it seems highly unlikely this could have happened. Joint actions provide national officials with a platform and funding for physical meetings on issues of common interest and are thus at their core about fostering collaboration. A pre-requisite for the joint actions to be able to boost collaboration among national administrations is for officials to actually take part in them. Available data for the first four years of the programme’s operation show that a large number of individuals (the vast majority of whom are tax officials) participate in the programme each year, at levels that are fairly stable and in line with historical trends. As with the previous funding period, there have been around 4,000 individual participations 11 per year during the current programme (lower numbers in 2014 are explained by administrative issues which mean that only April-December are counted for that year). The monitoring data and national authorities’ questionnaire both make clear that perceptions of the joint actions are generally very favourable. For example, the monitoring data shows that regardless of the type of joint action and operational objective, action participants have in over 90% of cases claimed that actions met their expectations, achieved intended results and were useful. Programme coordinators were also very positive. The Performance Monitoring Framework data suggest as well that the outputs of the joint actions (e.g. recommendations, guidelines, studies, best practice, working documents, administrative procedures, etc.) are broadly shared. 95% of participants declared disseminating the outputs within their administration while 80% use them actively in their day-to-day work. Defining specific outputs can sometimes be difficult due to the sheer divergence of them. Moreover, some of them are not easily captured in any monitoring framework as they concern less tangible and more difficult to measure networking. It seems however that whatever knowledge was gained through the joint actions was broadly used and shared. There were also some points of criticism mainly concerning details that, if tweaked, could make the system work a little better. Low participation among some (particularly large) countries, combined with limited engagement in areas where the connection to EU policy is relatively weak. Given the importance of network effects for the success of many actions, this shows that the case for collaboration needs to be made more strongly in these areas, alongside efforts to secure enough buy-in from relevant officials and administrations. For the newer types of actions (such as expert teams), there is a need for better communication and promotion so that officials become aware of these actions and their possible benefits. Monitoring activities could also be adapted to take into account the specificities of certain kinds of action (such as platform-like project groups) whose outputs are not easily captured with the current set of tools. Very low participation among a few Member States and a few candidate and potential candidate countries points a need for special efforts to involve them more. The IT catalyst project group grew out of an IT collaboration group in the previous programme and a workshop from 2014 to provide the Member States with a platform to discuss, initiate and coordinate IT projects and activities in a structured way. Interviewees explained that a crucial benefit of the catalyst group was that it brought together key IT and policy officials from different countries and gave them a chance to learn about each other’s perspectives, current projects and longer-term aims. This reportedly built trust, paving the way for gradual convergence and the launch of specific IT projects. Interviewees felt the confidence and knowledge of each other’s ways of working needed to pursue such projects would not have been possible without the catalyst group. The Mini-one-stop-shop technical workshops represented a major step forward in collaboration between the Member States on VAT issues and came with the commensurate need for tax administrations and economic operators to get used to new systems and processes. A series of instructional workshops accompanied the launch of the mini-one-stop-shop in order to explain its features, answer questions and ensure that the system would be rolled out smoothly. Feedback indicates that the workshops were largely successful, based on their obvious relevance, instruction by knowledgeable experts and suitable practical format. The workshops can be seen to have contributed to the successful launch of the system in the Member States and its high level of uptake so far. The 2016 workshop on country-by-country reporting in relation to transfer pricing reports brought together participants from six Member States and experts from Australia, the United States and South Africa, as well as experts from the private sector. The purpose of the workshop was to reinforce the skills and competence of tax officials and to let participants share examples of country-by-country reports and best practices to guarantee the appropriate and effective use of report data. As Australia and South Africa had already developed their national legislation to require country-by-country reports, the idea was for EU countries to learn and discuss with these experts. Participants expressed positive views about the usefulness of the workshop for its networking and learning components and claimed that it helped to implement country-by-country reporting in the Member States involved. However, it is difficult to gauge the wider impact of this exercise in terms of the extent to which the results were taken up in practice. To sum up, the joint actions are highly utilised and appreciated tools that between them offer the Member States and other participating countries a mix of formats that meet their practical needs. Criticism focused on making incremental improvements rather than fundamental changes, while the introduction of two new action types (i.e. expert teams and presence in administrative offices / participation in administrative enquiries) has boosted the programme’s potential. ·perceived administrative burdens related to organisation of joint actions, such as working visits or expert teams, risk resulting in lower uptake of and engagement in joint actions. Although the relative weight in the Fiscalis 2020 programme’s funding dedicated to training is small (around 3% of all budget), it has an important and unique role, supporting also the performance of joint actions and IT systems. At the same time, its benefits may indeed seem less palpable, not easily measurable and less wide-reaching. While the amount of resources at stake are not insignificant, the training activities would not be expected to generate as wide-reaching and profound benefits as the joint actions and European Information systems described in the previous sections. Incorporating common training material across administrations with different cultures, priorities and existing curricula is inherently difficult. The eLearning modules developed through the programme have to a certain extent surmounted these barriers, adding real value to the knowledge base of officials in some Member States (especially those with relatively few resources for such matters) and being used to complement (but not replace) existing courses and training. This has contributed above all to the use of European Information Systems and understanding and application of EU law. This can be judged as adequate given the relatively small proportion of the programme budget dedicated to training. Training sessions on specific European Information Systems are also widely appreciated. For example, the case study fieldwork showed that the countries covered see added value from the VAT training modules and have been willing to invest substantial resources into translations and making them available to officials. Most of the seven fieldwork countries were using the modules to some extent, whereas two were using them more intensely. Countries using the modules lauded them for providing concise and user-friendly introductions to EU VAT legislation, mainly for new staff. They also appreciated the modules for being short and easy for officials to digest. The ability to look at English and national versions side-by-side was seen as useful for getting up to speed with key terms. The case study interviews show that decisions to use the modules relate not to their quality, which was universally reviewed positively, but rather to perceived needs (or lack thereof) and the fit of the modules alongside existing material. Countries opting not to use the modules pointed mainly to the existing offer of national training material, but also to courses offered by the Intra-European Organization of Tax Administrations and the Organisation for Economic Co-operation and Development. Interestingly, some Member States did not use the modules or only did so to a limited extent despite not offering corresponding training on the EU aspects of VAT legislation. This reveals discrepancies in the level of priority given to these aspects within national hierarchies that are unrelated to the training modules provided through Fiscalis. While administrations are the main beneficiaries of the programme, economic operators are also involved, as participants in specific joint actions and users of some IT systems (most importantly databases related to VAT and excise, in addition to the Mini-One-Stop-Shop) and training modules (most importantly on the VAT Directive). The latest Fiscalis progress report shows that use of the main systems available to economic operators has been steadily increasing. This includes registrations for the Mini-One-Stop-Shop, number of VAT refund messages, number of VIES-on-the-web messages and consultations of System for Exchange of Excise Data. An exception was the number of consultations of Taxes in Europe Database, where a recent decrease has been attributed to the system’s obsolescence; however a new version is in preparation. Similarly, the number of downloads of the publicly available eLearning modules has seen a sharp increase in line with the publication of the new VAT package. Economic operators such as trade associations are also invited to participate in joint actions where their input is particularly relevant. Monitoring data show that 187 external participants have been financed to take part in joint actions through 2018, although it is not possible to ascertain precisely how many of these are economic operators. Case study interviewees reported considerable reductions in reporting obligations and trade delays for economic operators since the release of the Excise Movement and Control System during the last programme. The Mini-One-Stop-Shop has also been reportedly well received by economic operators, according to interviewees responsible for dealing with queries at national level. More importantly, the benefits of this system for traders, especially small and medium enterprises, are expected to increase exponentially during the next programme, when it is expanded to cover physical (rather than only electronic) goods. As already stated, economic operators are also users of the eLearning modules supported by Fiscalis 2020, mostly the VAT eLearning package consisting of 12 courses, which were downloaded from the EUROPA site over 26.000 times between 2014 and 2017. Most of the users are professional associations or multinationals who then make the eLearning available to their staff. Other popular courses concerned the Excise Movement and Control System and the VAT Fraud module which were broadly found useful. In general, however, the uptake of eLearning by economic operators seems to be low, looking purely at the size of this group of stakeholders. Lack of awareness, time to prioritise the modules or incentives as well as linguistic or technical barriers (in particular for smaller businesses) were amongst the factors impeding a broader use. To recall, the specific objectives of Fiscalis 2020 relate to supporting the fight against tax fraud, tax evasion and aggressive tax planning and the implementation of Union law in the field of taxation. This is to be done by ensuring exchange of information, by supporting administrative cooperation and by enhancing the administrative capacity of participating countries with a view to assisting in reducing the administrative burden on tax authorities and the compliance costs for taxpayers. With regard to supporting the fight against tax fraud, tax evasion and aggressive tax planning, the available evidence shows that the existing information-sharing tools and collaboration fora can make a big contribution to the objective. The 2015 Annual Progress Report also describes notable progress in the coordination of excise and customs procedures, which were achieved through a joint Fiscalis and Customs programme project group on the subject, which continued its activities during 2016. Over time, more harmonised procedures and raised awareness among administrations are expected to help combat fraud. Based on the assessment of working visits more generally, it can be reasonable to assume that the many working visits funded in the project of VAT fraud have increased collaboration, information-sharing and trust. By supporting the implementation of Union law in the field of taxation by securing the exchange of information, the programme has played a crucial role in helping Member States communicate with each other securely and efficiently in areas of mutual interest and thereby to enhance collaboration between them. The evidence reveals not only growing use of the systems as a whole, but powerful stories to explain how they facilitate administrations’ day-to-day work. Contributions were most pronounced in the areas of fighting tax fraud / evasion in the areas of VAT and excise (for IT systems such as the Mini-One-Stop-Shop, VAT Refund, eForms or Vies-on-Web). The contribution was seen as less pronounced for the smaller number of IT systems dealing with direct taxation (such as the Tax Identification Number on Europa portal or the Data Dissemination System), which had a smaller scope, with correspondingly lower awareness, participation or use levels. It should also be noted that the role of the IT systems is cross-cutting. Since information-sharing is a means for achieving the other objectives, most importantly related to the fight against tax fraud, evasion and aggressive tax planning, and the implementation of EU law, the systems have also contributed strongly to these objectives. Moreover, many of the systems are also available to economic operators, allowing them to submit and obtain information more easily and thereby lighten their burden from reporting obligations. With regard to support to the implementation of Union law by supporting administrative cooperation this has mostly taken the form of joint actions, though in a diverse array of topics and action types. Many of these have consisted of project groups and workshops to discuss the details for implementing specific pieces of legislation, in particular the Savings Directive, and Mutual Assistance for the Recovery of Claims Directive and recent Directives on Administrative Cooperation in the area of direct taxation. Direct administrative cooperation, in the form of multilateral controls and participation in administrative enquiries, is also categorised under this objective. In-depth case studies were conducted on both of these types of actions, and for the former reached very positive results. As one of the most popular types of actions (over 3,000 officials had taken part during 2014-2017), multilateral controls provide ample evidence that practical administrative cooperation not only takes place, but that it is also effective. Combined with a coordination group, which helped to align working practices and build trust, multilateral controls were found to lead consistently to recovered revenue and increased compliance. Moreover, despite the potential incentive for Member States to collaborate without the Fiscalis funding, this was seen to provide a framework to smooth the process and convince administrative hierarchies that cross-border cases were worth pursuing. The only caveat was that participation was somewhat uneven across countries, with some that are more active and more involved compared to others. This indicates that the contribution to administrative cooperation is similarly uneven, creating a need to inform more the administrations about the potential benefits. Actions related to participation in administrative enquiries, which were only introduced for the current programme, have also led to increased cooperation among the administrations that have taken part in them. However, awareness and participation in this new type of action is still relatively limited. Discrepancies across countries and gaps in knowledge, in addition to the constantly evolving tax policy context, create a need for the programme to support capacity building among the national administrations. This has taken place through several types of joint actions, as well as dedicated technical assistance actions provided by the European Commission. The eLearning modules developed through the programme are also aimed primarily at building the capacity of participating officials. Fiscalis is a directly managed programme, which means that the Commission is responsible for its management and coordination. The programme management team also is responsible for adopting Annual Work Programmes that set out the details of the activities to be pursued each year. Each year, through the Annual Work Programmes, the Commission sets the key priority areas for the given year, in which process the national tax administrations are involved. This approach is well appreciated by the Commission services, particularly for components developed at EU level but implemented at the national level, while tax administrations see it as an opportunity to have their specific needs addressed, which in turn creates a feeling of ownership. The Fiscalis 2020 committee, made up of representatives of the Member States and chaired by the Commission, is heavily involved in decision-making through regular formal and informal consultation. Activities are financed mostly through grants (especially the joint actions) and procurement (especially the European Information Systems and technical development of the eLearning modules). Applications for joint actions are done by the participating countries or the Commission. The median time for processing joint action applications is 13 days for working visits and 39 days for other types of joint actions. That is regarded as broadly efficient and allowing the funding decision and payments, based on pre-financing instalments, to be delivered on time. The programme’s overall structure and processes for taking decisions and setting priorities are time-tested and broadly appropriate in the eyes of stakeholders both in the European Commission and in participating country administrations. While the Commission drives the process, national administrations appreciated and described benefiting from formal and informal consultation. Combined with the flexibility and breadth of the programme, this ensured that annual priorities matched perceived needs and allowed desired activities to be financed. The broadly positive findings under relevance and effectiveness also testify to the suitability of the overall programme design. The Commission broadly accepted the recommendations by setting up an Action Plan outlining the extent to and ways in which the recommendations would be implemented 13 . In 2016, the Commission reported on progress in implementing the Action Plan according to which a large majority of recommendations were achieved with the remaining actions − mainly IT related, which naturally demand more time− still under implementation. Appreciated changes were introduced to the management of the joint actions, structuring of the Annual Work Programmes and monitoring performance of the programme. In order to bring in more coherence and practical connections between related activities, the Commission restructured the work programmes by reducing the number of projects and providing expected actions and results in each case in order to create a more systematic mechanism to monitoring and communicating outcomes. Additionally, to support the latter, the Commission drafted a communication strategy, which included the use of new communication tools and channels, as well as a joint effort between the EU and national programme teams to raise awareness. Following up on recommendations to streamline the platforms for sharing documents and facilitating communication, the Commission produced strategy plans to improve the Programme Information and Collaboration Space and the Activity Reporting Tool, implementation of which is still ongoing. There have also been recommendations addressing technical issues of specific IT systems, enhancing the integration of EU and national IT systems, and promoting efficiency gains to encourage further harmonisation. While most of the recommendations were followed up, there remain a few, which are still underway but are more resource intensive and systemic in nature, involving large-scale changes relating to integration, harmonisation and development of IT systems. To address long-standing problems with a lack of monitoring data acknowledged in all previous evaluations, the European Commission developed and implemented the Performance Measurement Framework. It was arguably the biggest single improvement to the programme, installing a more evidence-based mind-set to programme management. In addition to facilitating performance management and ongoing improvement, the monitoring framework increases transparency by making the achievements of the programme more visible and accessible. The framework is ambitious. For the Fiscalis programme, there are 71 output and results indicators and 20 impact indicators. Progress is reported on annually through the Annual Progress Reports. Data used to inform the framework comes from proposal forms, action follow-up forms, event assessment forms, Programme Polls and other evaluations. The progress reports present data at activity level and for the indicators at output and result levels. These cover the broad majority of expected issues and are vastly more comprehensive than any monitoring conducted of previous iterations of the programme. Raw data confirms that at activity level the data is available, factually correct and very useful. However, at output and result levels the framework relies mainly on self-reporting data from stakeholders, especially regarding the joint actions, which has its drawbacks. Firstly, the questionnaire forms put together to inform the framework need to be universal, covering a myriad of joint actions. This proved difficult, since asking standardised questions about outputs and results of actions that are highly diverse in terms of timeframe, objectives, scope and other issues necessarily simplifies reality and renders the data less meaningful. Secondly, the questionnaires are answered by action managers and participants, and are related mainly to subjective issues on the level of agreement with certain statements, such as whether given actions helped increase understanding, provided good networking opportunities, or were considered useful. Finally, the frequency and length of the feedback and reporting exercises are turning stakeholders off, leading to superficial completion and ultimately diminishing returns for the time and resources needed to collect data, analyse them and report are dear. The impact indicators seem to be equally problematic. As explained in the data limitation section, the causal chains between activities and high-level objectives in the Fiscalis 2020 programme are long. The longer the casual chains are, the higher the number of other factors impacting the high-level objectives is. This makes it very difficult to make any strong claims on the causality between the activities carried out and the high-level changes observed. Combined with practical difficulties to obtain the data, a majority of the indicators appear individually unsuitable for the following main reasons: they are either really result-level indicators relating to perceptions rather than observable changes and already captured in other parts of the framework, are not easily obtainable, or are only remotely relevant, particularly when coming from sources external to the programme. Only for a handful of indicators the programme management can perform relevant analyses but these with uncertain timeframes and at irregular intervals. That results in a situation whereby little of the output or results data appears to feed into continuous improvement or decision-making. The national administrations are overwhelmingly of the opinion that taking part in an existing joint action is proportionate to the costs incurred in participating (27 out of 30 national administrations agreed). However, as it was stated in the previous section, there are some concerns with the new process of applying to a joint action and related reporting obligations (particularly for the working visits), which seem due to the perceived administrative paperwork, short deadlines for nomination of representatives and logistics behind their participation in joint actions and diminishing resources in general. Some national administrations expressed concern that administrative resources could impose a barrier to participation but overall they do not contest the need to coordinate and justify relevance of actions, which warrants the Commission’s approach. Organisation of expert teams can serve as an example of administrative burdens although due to the young age of that type of joint actions, it cannot represent all other types. The Activity Reporting Tool (ART) currently does not support financial reporting of expert teams. This resulted in time-consuming collection and manual calculation of financial data such as daily allowances or travel costs in different currencies. Communication around the Fiscalis 2020 programme falls under the responsibility of the Commission Programme Management Team. This team creates the main communication tools and runs some of the communication channels ensuring and coordinating information flow between all the coordinating bodies behind the programme. At national level, communication is tasked to national programme coordinators and delegates of the Fiscalis 2020 Committee. Effective communication, dissemination of harmonised messages and availability of information-sharing channels are important as their recipients are seen as multipliers of the programme at various levels. In terms of IT platforms and databases that support the programme in terms of information sharing and communication, the views of the users were in general positive, with specific ideas for improvements mentioned. Most national administrations consulted felt very strongly that the Activity Reporting Tool (ART) is a user-friendly platform and an efficient system for monitoring participants’ expenses and providing general feedback on the joint actions. In terms of sharing information easily and quickly, the Programme Information and Collaboration Space (PICS) is the main global information and communication tool, aiming at improving the collaboration between Member States and the Commission thanks to features that complement and enhance the collaboration organised in the framework of programme activities (which mainly takes place through meetings, calls or e-mails). However, it is also useful to enhance internal collaboration and for sharing relevant expertise, experience and coordination between programme management team, national programme coordinators and other stakeholders involved in the management of programme activities. Despite general appreciation of the improvements to the collaboration space overtime, there still seems to be room to improve further the user-friendliness of that tool as well as its broader use. User-friendliness aspects was also raised in the context of the Communication and Information Resource Centre for Administrations, Businesses and Citizens platform (CIRCABC) 14 , a document management system to exchange information between the Commission and national administrations, even though there too continued to be an overall positive perception of the tool. The recent update to the platform (September 2018) has addressed some of the concerns related to this criticism. Customs 2020 is the ‘sister’ spending programme in the field of customs. It is important to discuss it under the efficiency question due to its alignment, at least at the central programme management level, with the Fiscalis 2020 programme. While the policy areas for the two programmes are different, they have a similar focus on enabling cooperation and exchange between administrations. These similarities offer many opportunities for synergies with the Customs programme in terms of both administrative arrangements and joint works, including cross-fertilisation and joint funding of shared components such as IT systems and similar approaches for human capacity building and training. The synergies are strongest at the programme management level, which is provided by the same team of Commission staff. Both programmes are fully aligned, based on identical procurement rules and grant models, common management guides and supported by Programme Coordination Groups. In terms of the IT systems, the two programmes share the backbone for trans-European IT systems, notably the Common Communication Network. The joint platform facilitates coordination of approaches and processes, which ensure coherence and create economies of scale by reducing duplication of efforts. Often taken for granted, that synergy is important from the point of view of technical arrangements at the programme management level as well as from the users’ perspective. When it comes to more content-related activities, synergies are more difficult to be established. However, two joint Fiscalis/Customs workshops were organised in 2016 and most recently in March 2018 on VAT and customs aspects of e-commerce. Another notable exception related to excise duties, which are anyway related and the administrative responsibility for them at the national level falls either on customs or tax administrations. Fiscalis 2020 provides explicit support to this cooperation in terms of identification of fields that are of common interest and where it is particularly important to cooperate for the proper implementation of the legislation. As an example, the project group on Coordination of Excise and Customs Procedures was a cross-programme action that brought together stakeholders from both authorities. It was originally set up (still under the Customs 2013 programme) because of the lack of interoperability between IT systems supporting customs (the Export Control System) and excise procedures (the Excise Movement and Control System). Their synchronisation was necessary to avoid legal uncertainties, inconsistencies and loopholes, which ultimately increased risk of fraud. It was perceived as a valuable way to build relationships and increase understanding between taxation and customs colleagues regarding common problems, both within and between national administrations. Still, some stakeholders still felt that more coordination and cross-fertilisation was needed and possible, for example in developing common IT systems or working closer on excise-related fraud. It was also felt that in the past there was more flexibility to use funds across programmes, allowing for more shared actions, which will no longer be possible in the future. This could reinforce working in silos and undermine some of the synergies described above if a practical solution is not found. There are also opportunities for shared approaches to human capacity building and training. The Training Support Group for the Customs and Fiscalis programmes supports the development and implementation of the EU Common Training Programmes, using strategies from both sides. This question focuses on figuring out whether the costs of the Fiscalis programme are proportionate to the benefits it has provided to tax administrations and society. Conceptually, this would mainly involve holding up the benefits identified through the effectiveness questions in light of various costs and other possible ways of spending equivalent time and money. Not many of the benefits were quantifiable, let alone monetised. The evaluation approaches this question by trying to identify savings and/or increased tax revenue as an effect of programme activities as well as the long-term and/or intangible benefits of programme activities. Between 2014-2017 project groups as a type of joint action hosted the highest number of participants (7.721 in total for 73 project groups keeping in mind that some project groups include more than one action). Working visits in turn saw the largest number of events (1346) but a substantially lower number of participants (1002). There were also 149 workshops and seminars (3.638 participants), 410 multilateral controls (3.108 participants) and 158 activities of presence in administrative offices / participation in administrative enquiries capacity building actions (219 participants) supported by the programme. Most of the expenses are participation-driven as they include transport, accommodation and daily allowance costs. A much smaller part of the costs covers organisation of events, with slight variations depending on the type of event. Consequently, the absolute costs are necessarily proportionate to participation levels and vary slightly between different types of actions. As project groups attract the highest participation, their share in the total budget for joint actions is relatively high at nearly 45% of all spending. However, thanks to economies of scale, it appears to be also one of the most cost-efficient methods with an average cost per participant 15 in the range of EUR 844. Project groups are perceived as needed and useful, providing opportunity to exchange on ideas, new technological trends, business solutions and IT approaches and align understanding of legislation and practices. It is arguably the main mechanism for achieving broader and inclusive continuous collaboration. Many project groups are quasi-permanent and serve standing cooperation platforms creating professional bonds and acting as catalysts. Workshops come second in line when it comes to participation and budget share and have a similar cost structure to seminars. Both of them, in particular the seminars, involve higher organisation costs covering such aspects as hiring of the venue, interpretations or refreshments. As they tend to group participants in the same venue, the accommodation costs are slightly higher. Average cost per participants comes at EUR 1 137. In many ways they bring similar benefits as the project groups. Tax officials appreciated those best for providing a quick and efficient platform for exploring difficult topics. Although the questionnaire with national authorities showed that some seminars and workshops were perceived to lack clear conclusions, qualitative interviews showed that seminars and workshops can have unexpected positive outcomes going beyond the main objectives of sharing best practices and encouraging shifts in national policies. The data highlights the cost-effectiveness of multilateral controls and, as they continue to gain momentum, the presence in administrative offices actions. Both types of action were praised for their direct links to recovered tax revenue as well as improved administrative cooperation. That they are relatively inexpensive is a further testament to their importance for the programme. For example, a single multilateral control action between Latvia, Belgium, Germany and Lithuania targeting trade in used cars and zinc led to extra revenues of €2.931.763 in VAT receipts and the collection of €200.000 in direct taxes. If one compares these benefits to the total costs of all multilateral controls supported by the programme (€2.061.271 for the period 2014-2017), it becomes evident that the value for money of the activities supported is outstanding. In terms of average cost per participants, working visits are slightly less costly than workshops and seminars with a cost of EUR 1 032. The relatively high costs compared to project groups are driven by higher accommodation costs and daily allowances, with travel costs in line with other actions, which are most likely explained by the fact that working visits tend to last longer. They are highly valuable for the involved tax officials as they provide practical experiences through on-the-ground observation that might not be possible otherwise. At the same time, due to their intimate nature, they encourage further bilateral cooperation. This activity type is among the most highly rated for its usefulness and would have been even more appreciated if not for the associated administrative burden they are associated with. The average cost per participant for all types of joint actions is around EUR 875, which is lower than the one under the previous version of the programme, Fiscalis 2013 (EUR 999). A further remark to be made is that an analysis of committed and actual expenses for joint actions shows that around 14% of committed funds go unused. This is roughly half of the disparity reported in the Fiscalis 2013 evaluation final report 16 (31.3%), which can be seen as an indication of a more efficient and accurate allocation of funds for joint actions compared to the Fiscalis 2013 programme. The largest part of the Fiscalis budget supports the development, operation and maintenance of the IT systems accounting for 74.7% of expenditure with nearly 91.4 million EUR committed over the programme’s first 4 years. This has been directed towards a number of development projects, the large architectural Common Communication Network 2 development project, and the support for existing systems within the field of taxation. The latter forms by far the single biggest budget line in the programme, accounting for nearly half of expenditure. These figures are summarised in the table below. Source: ART data. Please note that due to methodological differences in calculating IT expenditure, the figures for ART data are slightly different from the Progress Report data mentioned in table 1. Concrete benefits brought by the IT systems are difficult to quantify, let alone monetise. The data do not allow for distinguishing between most of the different systems in order to compare costs with demonstrated effectiveness. 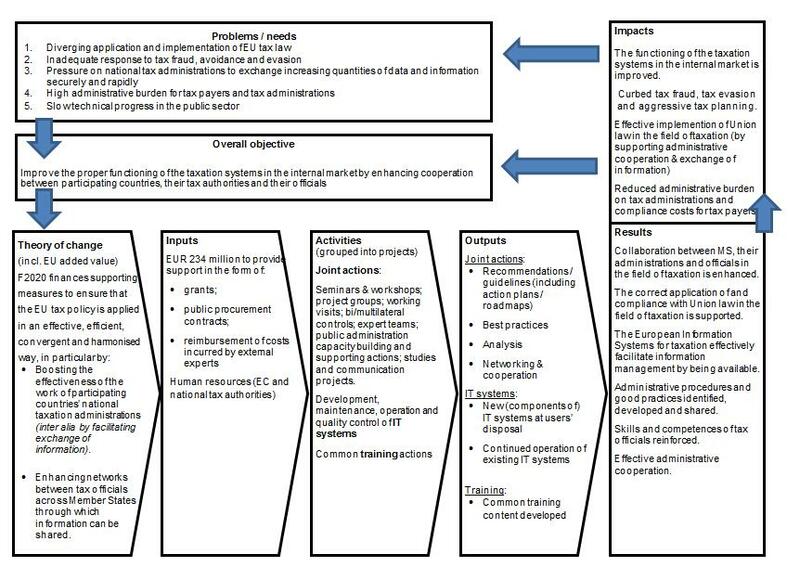 One of the main findings of the evaluation is that the horizontal architecture and systems associated with indirect taxation, such as the VAT Information Exchange System, the Excise Movement and Control System and the Mini-One-Stop-Shop were the most positively assessed and often lead to substantial savings for tax administrations and economic operators. As an example, one national interview respondent made a rough estimate that the implementation of the excise system had reduced the burden on excise officials by a factor of ten, due to the digitalised environment allowing for much more efficient monitoring. In terms of functionality, major European Information Systems like Excise Movement and Control System and the Mini-One-Stop-Shop have also been referred to by several interviewees as “revolutionary” in their fields, leading to completely new possibilities for monitoring, sharing of information, and prevention of fraud. Secondary benefits include new opportunities for big data analysis for e.g. compliance risk management. The expansion of the Mini-One-Stop-Shop in the next programme (to cover physical products) is expected to generate especially big benefits for tax collection and the facilitation of trade. Most of those interviewed as part of the evaluation have seen little or no overlap/redundancy between efforts to develop European Information Systems and existing national systems. While some IT systems have replaced existing systems and functions, they have done so in order to also add new functionalities. Some of the direct taxation-related databases are less widely used, sometimes redundant and hence harder to justify investing in. While it was acknowledged that such systems are in the minority, measures could be taken to either increase their use or allocate the funding to other priorities, especially given some of the ambitious projects (such as the full One-Stop-Shop) foreseen for the next funding period. 17 IT collaboration offers the potential to generate significant economies of scale by reducing the need for Member States to develop systems individually. While the small number of Member States using the modules for the automatic exchange of information did not achieve the critical mass needed to provide such value in this way, more uptake and better results would be expected in future, especially if teething problems related to project management and timing are addressed. Training activities under Fiscalis 2020 programme totalled 3.2% of the budget with nearly 4 million EUR committed over the programme’s first 4 years. Whilst this may seem insignificant training activities are arguably relatively the most cost-efficient activities and have a unique role to play. Because development costs of training modules is largely a one-off investment, its efficiency and value for money increases with every additional participant as this broader reach takes places at little additional cost, if any. The steady growth of national tax officials who participated in the trainings, and downloads from the public domain show that the need is there and Fiscalis 2020 training material fills that gap (see Annex 4 for more detailed figures on training). The flagship product under this programme component is the VAT eLearning package consisting of 12 courses. Overall, for the period 2014 to 2017 around 46.700 tax officials have been trained through Fiscalis 2020. In addition to this, the eLearning modules have been downloaded 34.950 times from the EUROPA website mostly by professional associations or multinationals. Based on the estimations provided by those who have downloaded the modules through the EUROPA site, a potential group of 420.000 trainees have been reached through the Fiscalis-sponsored training modules. The evidence assessed confirms that the programme is internally coherent. There is a high level of consistency between the intervention logic, programme objectives, Annual Work Programme priorities and projects. The programme’s design is objective-driven, which means that all actions under the programme must refer to the objectives outlined in Regulation (EU) No 1286/2013. The programme actions are determined in accordance with the general, specific and operational objectives, and the most appropriate method of implementation. National interviewees pointed to the flexibility and comprehensiveness of the Annual Work Programmes as key strengths, being able to fit a wide range of concrete actions. These reflect national priorities within the over-arching priorities of the programme. The continuity of the programme, in particular the fact that it is the fourth Union action programme for taxation, is a crucial element to understand how its different components fit together. An example of the value of the gradual refinement (based in part on periodic evaluations to assess implementation) of the programme in terms of synergies and complementarity is the introduction of expert teams in the current programme. These are able to play a concentrated supporting role for a variety of projects, as evidenced by their relevance according to many interviewees, and ability to feed other platforms with needed expertise and capacity. The programme's design and its implementation through agreed joint actions create possibilities to enhance synergies between the programme's components and the way it is actually used. The coordinated central approach to the programme's implementation, through a single Commission Programme Management Team supported by various groups, has the objective to ensure coherence, reap benefits of best practice and common approaches. At the practical level, the programme management is supported by the national programme coordinators from the tax administrations in participating countries, and the Commission internal Programme Coordination Group. Participation of programme coordinators in the management of the programme guarantees the smooth exchange of information and coordination at national level. The coordination group in turn has an advisory and supporting role in relation to programming, implementation and performance measurement. Specifically, the group ensures coherence between objectives and policy priorities of the programme and those of the Commission as stated in the Management Plan, helps to identify synergies and joint initiatives with the view to preventing overlaps and optimising the use of resources (both human and financial), and seeks to optimise the use of the programme through an increased involvement of all policy units to ensure ownership and improve dissemination and sharing of information. In addition to the programme management team and the central bodies for advising and steering the programme (e.g. the Fiscalis 2020 Committee), there are also a number of coordinating activities and fora for different projects and activities. These include Commission expert groups and the programme’s project groups with a coordinating function. As an example of the former, the “EMCS Computerisation Working Party” is instrumental in the continuous management and improvement of the Excise Movement and Control System. An example of the latter, the “IT Collaboration Catalyst Group” (partly reviewed in the case study on IT collaboration) works for Member States to get a more coherent view of IT solutions and IT projects. Given the number of groups involved in the management of the programme, including the management and coordinating bodies presented in the section above, and the numerous projects and activities carried out, the Programme Implementation Guidance recognises the importance of efficient coordination and communication mechanisms and channels between the programme management bodies and with other coordinating bodies. At EU level, coordination and information flow are the responsibility of the programme management team, supported by Commission officials and senior management, who are in frequent contact with national tax administrations and other relevant stakeholders. At national level, communication is tasked to national programme coordinators and delegates of the Fiscalis 2020 Committee. In this context of multiple programme multipliers (both within the Commission and at national level), internal communication and information-sharing practices are important to disseminate harmonised messages and to make use of available communication tools and channels. One example aimed at strengthening internal synergies and interlinks are the programme’s activity schemes, which have been developed to support the transparency, management and coordination of the activities carried out under the programme. The schemes provide a visual overview of activities, with clear steering and reporting links to other fora. Synergies and complementarities, to keep them up and increasing, require in practice a successful exploitation of information sharing features between different programme stakeholders, as well as effective communication and dissemination of key programme tools and messages. The evaluation demonstrated an overall contentment with the communication and information-sharing tools and platforms. However, an ongoing emphasis on their better design and exploitation, adhering to the needs of their users and audiences, should be a continuous effort behind the programme's management. The Fiscalis 2020 programme is inscribed in the 2020 Strategy, where it is to contribute to the realisation of the Europe 2020 Strategy for smart, sustainable and inclusive growth by strengthening the functioning of the single market 18 . The Fiscalis 2020 programme is funded under the multiannual financial framework heading of “Smart and inclusive Growth”. As mentioned in the Strategic Plan for 2016-2020 19 , a coherent tax strategy and uniform implementation of EU law are needed to limit the distortions to competition and disruptions to the single market which can arise from the interaction of the 28 Member State tax systems. There was broad consensus among national administrations consulted that the networking component of the programme is extremely beneficial for their administrations, and the systems for information-sharing range from useful to outright defining administrative procedures in their respective areas. Thus, programme action in general highly corresponds to the envisaged contribution to the Europe 2020 Strategy. Recital (14) of the Fiscalis 2020 programme Regulation states that ʺresources should be shared with other Union funding instruments if the envisaged activities under the Programme pursue objectives which are common to various funding instruments, excluding however double financing”. One concrete case of active coordination with another EU programme was with the Structural Reform Support Programme. This programme, run by the European Commission's Structural Reform Support Service provides tailor-made support to EU countries for their institutional, administrative and growth-enhancing reform processes. The programme is complementary with Fiscalis, helping to ensure that EU tax policy is implemented consistently across all EU countries. The support service focuses on providing specialised technical support. This led to the establishment of coordination and regular communication to prevent duplication, exchange information, support national coordinators and provide feedback on finalised projects. Coordination between the two programmes has reportedly increased the effectiveness of both of their actions in the countries concerned. Findings from the ex-ante evaluation on a potential successor programme to Fiscalis 20 and further desk research also identified a number of other programmes with potential complementarities with Fiscalis. These included the Single Market programme, Justice, Rights and Values programme, EU anti-fraud programme for the protection of financial interests, Horizon 2020 programme and Hercule, as well as all programmes which run significant electronic systems. There are six candidate and potential candidate countries participating in Fiscalis 2020: Albania, Bosnia and Herzegovina, The Former Yugoslav Republic of Macedonia, Montenegro, Serbia and Turkey. In general, the level of participation varies over countries and years, but there is a definite interest to participate. These countries have also expressed their wish to deepen their participation in the programme. Adding up data from the Progress Reports for 2014-2017 there was a total of 1020 proposals (reported per initiating country), of which 59 came from candidate and potential candidate countries. While this figure might seem low, it is comparable with the number of proposals received from some of the less active Member States in the programme. Concerning specific activities where third countries have engaged with the programme, for joint actions the working visits are one of the main tools for candidate and potential candidate countries to participate, as they are able to arrange these of their own account. Outside these, they also receive direct invitations to certain other activities such as workshops, seminars, etc. Concerning IT systems, one example of an IT system providing functionality for non-Member States is the Mini-One-Stop-Shop, through its Non-Union Scheme. Out of 14 099 registered traders on the Mini-One-Stop-Shop platform as of 2017, 962 were registered for the Non-Union Scheme. In addition, communication activities were organised for the benefit of non-EU countries in order to share information on the new regime. Training activities are available to all countries through publicly available modules on the EUROPA website. Candidate and potential candidate countries can also deepen their participation through engagement with the training platform and various activities, though language barriers and limited resources seem to have restricted such participation for many. The programme and the different types of activities funded were perceived to have added value to the work of national tax administrations and economic operators by generating clear efficiency gains and economies of scale. For joint actions the main positive elements highlighted by respondents were the exchange of best practice, knowledge and information; opportunities for networking, cooperation and continuous communication; the possibility to enhance the understanding of EU tax legislation and corresponding issues, along with common problems and options for solutions; and, for multilateral controls, the operative results and impacts generated from collaboration. The European Information Systems supported by the Fiscalis programme have led to substantial, if hard to quantify, cost savings for national administrations in the form of reduced IT spending and human resources. Centrally developed systems are cheaper to develop and implement than 28 individual national systems, also avoid costs relating to interoperability between countries. Where systems are split between EU and national components, the programme ensures interconnectivity and efficient coexistence between countries. Table 3 presents examples of cost savings brought by the IT tax systems for national administrations. Automatic Exchange of Information modules: IT collaboration used in connection with automatic exchange of information and statistics resulting in saved resources for the countries using the modules that were developed. While these only include a few Member States, there is a potential for much more significant gains through additional IT collaboration in the future. Common Communication Network and eForms: contributes to a simplification of procedures, and thus to a reduction in time needed to process a request. Results in reduced postal charges as well as faster communication time. Excise Movement and Control System: Has reduced work intensity and personnel needed to monitor excise goods movements. IT capacity building: Improved understanding and practice/training in regard to new processes and procedures lead to a more efficient execution of tasks and exchange of required data, implementation of new functionalities, etc. All in all, this helps reduce costs and time spent by the national administrations. Source: Evaluation questionnaire with national authorities – part 2 (IT systems) and interviews. *While not IT systems per se, cost savings for Member State IT collaboration have been included to further illustrate the EU added value of taxation IT collaboration. The programme’s common training activities, particularly the eLearning modules that were assessed in depth, were found to save time and money, but only for the Member States which so far use them. Respondents were divided, with some indicating that they were not dependent on these training modules. Others, however, underlined that it was a good complement to their national training and that these modules could be more easily shared. The modules were also said to cover some areas (VAT-fraud) not covered by national curricula in some cases, and to contribute to the national administration’s obligation of providing training to its officials. There was consensus among national programme coordinators consulted that Fiscalis 2020 provides the possibility for action above and beyond what participating countries could achieve on their own. Overall, the programme has been effective at attempting to provide solutions for problems and issues for which there is a clear EU dimension. Interviewees mentioned that, without the programme, administrations would not be able to collaborate in the way that they do today. It was highlighted that without the programme, countries would diverge to a greater extent. The sharing of knowledge was also pointed out as a structurally significant benefit of the programme, providing added value no matter the specific national priorities and needs. In relation to different actions taken by the programme, investigated as part of the case studies, most of these pointed towards synergies and complementarity of efforts vis-à-vis national activities. As an example, the multilateral controls and presence in administrative enquiries are indispensable tools to realise the type of administrative cooperation and information-sharing they support. They complement and tap into action at the national level, leading to results which would otherwise not be achievable. Evidence collected for the evaluation confirms that there is wide consensus among national tax administrations that Fiscalis 2020 activities add value compared to other options for collaboration and policy implementation. In general, interviewees within a number of fields mentioned the Intra-European Organisation of Tax Administrations (IOTA), the Organisation for Economic Co-operation and Development (OECD) (and to some extent the International Monetary Fund (IMF) and the World Bank) as other arenas for cooperation. Especially IOTA was brought up as a collaboration platform which touches upon many of the same areas as Fiscalis 2020. The general view was that these other international platforms by no means substitute Fiscalis or provide the same type of concrete and close cooperation. However, there were mentions of overlap within specific intervention areas. This mainly concerned activities relating to knowledge-sharing within current international taxation issues, such as emerging practices for risk management. Within such areas, there is an opportunity for higher degrees of coordinating priorities and activities with the work conducted within other platforms. Findings from the evaluation questionnaire with national authorities showed broad levels of agreement regarding how the Fiscalis 2020 programme complements (rather than duplicates) Fiscalis initiatives at national level, with 25 out of 29 respondents who agreed to a great extent or to some extent with the statement. Specifically, consultation and networking with colleagues from other countries through the joint actions were considered as complementary to initiatives at national level, helping to build relationships and trust as well as supporting the sharing of experience and knowledge. Specifically, as to the building of trust, respondents mentioned that in many cases personal contacts are formed between officials following joint action activities, and participants often continue to work together on a bilateral or multilateral level following the end of an activity. This view was supported by interview data, where several interviewees in different positions and working through different activities highlighted the sustaining contacts created in different programme activities. This is an important benefit of the programme, though less visible compared to the activities themselves. Concerning the implementation of EU legislation, joint actions were said to support both the pre-legislation work, and the following actual implementation of EU legal acts. The opportunity to meet with colleagues from other Member States and discuss legislative changes was highlighted. Furthermore, the involvement of the business side in such meetings was mentioned as valuable as they are aware of other problems that also need to be taken into account in the implementing process. The dialogue and discussions seem to enable a more harmonised transposition of the legislation. It was also mentioned that the joint actions are useful for the candidate and potential candidate countries regarding alignment of national legislation with the EU acquis. National authorities believe that the programme led to concrete outputs and results that would be useful in the future even if the programme were discontinued. Some examples include an effective application and understanding of excise legislation, increased competence of the national administrations, advanced administrative cooperation, IT systems, capacity building activities, an exchange of views, knowledge and expertise, and a creation of networks, tools and methods. The Compliance Risk Management Platform was mentioned as valuable, as well as the outcomes resulting from its activities. Moreover, improved capacity, implementation of projects, as well as working visits, were mentioned as activities with long-lasting impact. Furthermore, the programme has contributed to an enhancement of administrative cooperation overall. Various activities have had an impact on enhancing and improving functions within the administrations through exchange and gathering of knowledge, procedures, methods, and legislative solutions. Respondents seem to believe that these impacts are long-lasting. Contacts made with other tax officials in EU Member States were also mentioned as a sustainable impact as networks have been created enabling and facilitating a dialogue in the coming years as well. However, for the outputs and results to be maintained and improved, the high importance of the programme’s continuation was emphasized. In particular, it was highlighted that a majority of the present funding of the European Information Systems is covered by the programme budget. Therefore, an interruption would cause immediate serious problems. Relevance: at the general level, the findings validate the relevance of the Fiscalis specific objective by identifying clear needs for secure and rapid exchange of information, cooperation between tax administrations, and enhancement of administrative capacity. There has been universal agreement among stakeholders that the programme is needed to facilitate this exchange and cooperation, and that ambitious policies would not be possible without such support. Thus, the programme’s role in fostering convergence of approaches, administrative procedures and rules is highly relevant. Effectiveness: through its three main types of activities (joint actions, European Information Systems and training), Fiscalis has played an integral role in reinforcing cooperation between tax authorities in the EU Member States and other participating countries. The programme has provided the framework and technological means necessary to work together and share information in the service of implementing EU tax law and fighting tax evasion, fraud and aggressive tax planning in an increasingly mobile Europe. Evidence of this was most compelling in the field of indirect taxation (particularly VAT and excise) where the EU competence is strongest, and the level of programme activity is correspondingly high. The evaluation finds that the programme has made strong contributions in all five aspects of its specific objective. These contributions have taken many forms and flow from the diversity of both the programme’s activities and aims and the policies they support. Each type of activity also contributed in unique ways to increased cooperation. The joint actions provide a menu of options which can be adapted to fit a wide range of collaboration needs, ranging across the policy cycle from early brainstorming and reflection through practical implementation and concrete operations, such as the carrying out of multilateral controls and administrative enquiries. The IT systems have played a crucial role in helping the Member States to communicate with each other securely and efficiently across many areas of mutual interest, facilitating the day-to-day work of administrations and contributing to the fight against tax fraud and evasion. While the eLearning modules are only in use in some Member States, they have shown to contribute meaningfully to the knowledge base, especially in places with relatively limited resources. Efficiency: while the programme’s benefits cannot be monetised, holding up the findings on effectiveness alongside spending data and the positive findings on operational efficiency makes a strong case that the programme overall is cost effective. In their different ways, the joint actions, European Information Systems and training activities clearly generate value for the EU and administrations, by helping them to pool resources, generate economies of scale and increase revenue collection and compliance and function more effectively. Economic operators have also benefited indirectly (through better administration of tax policy), as well as from the direct use of certain IT systems and eLearning modules. Coherence: there is strong internal coherence between the various levels and components of the Fiscalis programme. This is the result of several factors, including an objective-driven design which ensures the alignment of the various levels of the intervention logic, from the general, specific and operational objectives, to the priorities and activities. Continued refinement and awareness raising of the introduced project structure should enhance this further. At an operational level, the coordination of the programme as well as its continuous duration have contributed to enhancing synergies and avoiding duplications. With regard to the programme’s external coherence, there is strong alignment between the programme and the Europe 2020 strategy, both on paper and in reality, as evidenced by relevant actions and activities. The involvement of candidate and potential candidate countries is overall positive, with robust evidence of active participation, and possibilities to engage these even further (as detailed in other sections of this report). EU added value: the programme has been effective in providing solutions for problems with a clear EU dimension. In particular, the programme adds value by providing a forum for discussion, exchange of experiences and networking between Member States that would not be possible without Commission support, as well as providing an otherwise highly unlikely framework and systems for exchange of information through a variety of systems and activities. These lead to both tangible and intangible benefits of scale and coordination. The clear EU component, and the fact that the same results would be difficult or impossible to achieve without the programme to support them, in particular in terms of necessary maintenance of European Information Systems, also leads the evaluation to conclude that continued support through funding of the programme is relevant and advantageous from the perspective of EU added value. The mid-term evaluation is a non-major initiative (PLAN/2017/933) organised in accordance with Article 17(1)(2) of Regulation (EU) No 1286/2013 of 11 December 2013 establishing an action programme to improve the operation of taxation systems in the European Union for the period 2014-2020 (Fiscalis 2020). The lead Directorate General for the evaluation was the Directorate General for Taxation and Customs Union (DG TAXUD). The Commission carried out the present evaluation with the help of an external consultant. The evaluation study was commissioned from Oxford Research, Coffey, Economisti Associati and wedoIT, through a framework contract with a consortium led by Economisti Associati Srl 21 . The specific contract was signed on the 14 August 2017 for a period of 13 months. The inter-service steering group met five times on 12th of September 2017, 15th of November 2017, 8th of March 2018, 30th of May 2018 and 29th of June 2018. The last meeting was a joint validation workshop for Customs 2020 and Fiscalis 2020 programmes during which the external consultants presented their findings, conclusions and recommendations. These were further on discussed with the group, their validity and credibility confirmed. The present evaluation SWD is based on the works carried out by the external consultant. The material informing this evaluation consisted of (1) programming documentation, (2) previous studies, reports and evaluations, and (3) the Performance Measurement Framework (PMF), as detailed in Table 4 , which presents as well the intended purpose of use. The evaluation gathered also primary data on the programme’s implementation, functioning, results and use directly from the best-placed stakeholders: the tax administrations of the participating countries and, albeit to a smaller extent, from economic operators. That evidence was collected through targeted questionnaires and a series of 7 thematic cases studies, which are described in a greater level of detail in Annex 3. Finally, the Commission organised a public consultation on the Commission’s spending programmes and funds. This public consultation was launched within the context of the Commission’s proposals for the next generation of financial programmes for the post-2020 Multiannual Financial Framework (MFF). The Fiscalis 2020 programme was included in the public consultation on investment, research and innovation, SMEs and single market. Details of the organisation and results of the public consultation are included in Annex 2. Background documentation detailing the structuring of the PMF, considerations and reasoning which lead to its instigation, the purpose of each data-collection tool, indicators and their use, etc. Indicator data not gathered as part of the PMF reporting tools, but collected from various sources in connection with evaluation reports. To ensure transparency and the validity of results, the evaluation used complementary methods to collect data from a large number of stakeholders. These included participants in the programme from EU and candidate and potential candidate country tax administrations and economic operators benefiting from certain programme activities, as well as European Commission officials responsible for managing and using the programme. In addition, the evaluation drew heavily on monitoring data that consisted in large part on feedback from relevant national officials as well as economic operators completing the publicly available eLearning modules. ·Questionnaires for national authorities (part of the programme assessment): two written questionnaires (one general questionnaire on joint actions, training and programme management, the other on funded IT systems) were distributed to the relevant authorities from participating countries. The questionnaires were sent to national coordinators, who were asked to elicit feedback from their administrations and provide a single response for each questionnaire and country. Response rates for the general questionnaire were very good, with completed questionnaires returned by 30 of 34 participating countries. Likely owing to consultation fatigue, only 14 of a possible 28 22 responses were provided for the IT-focused questionnaire, despite mitigating measures such as extending the deadline and individual follow-up messages. This was supplemented with feedback received through the other consultation tools as well as satisfaction figures on given IT systems from the monitoring data. ·Programme manager interviews (part of the programme assessment): a set of interviews with managers and users from the Commission (21 interviews) and national administrations (eight national coordinators) allowed us to collect experiences, opinions, perceptions and suggestions regarding a range issues that would be difficult to obtain using other means. These included matters such as responsiveness of the programme to emerging needs and priorities, organisational and governance structures and processes, practical implementation, change in programme performance over time and any barriers to the success of the programme. There was also a special focus on the IT systems used for programme and financial management. ·Thematic case studies of Annual Work Programme projects: these consisted of in-depth qualitative research in the form of seven case studies, each focused on a theme linked to the Annual Work Programme projects that were defined as priorities in given years. For each of seven particularly salient themes, the evaluation examined the actions involved based most importantly on fieldwork comprised of 87 interviews with relevant officials in seven countries as well as responsible officials at the European Commission. 23 . ·Survey of economic operators: while economic operators are not the programme’s main beneficiaries, their views are important as taxpayers and users of certain IT systems and eLearning modules. A public consultation was initially foreseen to gather the opinions from economic operators and citizens more broadly. However, a decision was taken within the Commission to group together questions relating to a wide range of spending programmes into a single public consultation. Since this did not include any questions related to Fiscalis, a short online survey of economic operators was carried out instead. The survey included a range of questions on the relevance of the programme’s objectives and activities and respondents’ experiences with several publicly available IT systems and eLearning modules. The survey was promoted through DG TAXUD’s newsletter and direct mailings to trade organisations in all Member States. However, it was not possible to post links to the survey directly on the websites of the services that were being asked about. Given the niche users of many of these services and a general feeling of consultation fatigue, the survey only received 43 responses. While not ideal, the survey still provided some useful insight from an otherwise difficult-to-reach group, which was supplemented using more substantial survey data on the eLearning modules collected on an ongoing basis by DG TAXUD. ·An open public consultation on "EU funds in the area of investment, research & innovation, SMEs and single market" was launched within the context of the Commission’s proposals for the next generation of financial programmes for the post-2020 Multiannual Financial Framework, which is the EU’s long-term budget. This consultation covered both the retrospective and prospective elements of the Commission’s spending programmes. It aimed at gathering the views of citizens on policy challenges and needs for EU intervention as regards taxation. The 4052 respondents provided feedback out of which only 6 reported that they have experience with the Fiscalis 2020 programme, representing 0.15 % of the total number of respondents. Also, only 47 comments referred to taxation. This very limited number of instances relating to Fiscalis confirms the limited overall interest of the public at large and the relevance of the programme objectives – and focus of stakeholders’ consultations – on tax administrations. Overall, the coverage of the consultation activities is deemed satisfactory. Nearly all of the national administrations which make up the programme’s main target audience provided feedback through questionnaires. While programme manager and case study interviews cannot be described as representative in a statistical sense, broad consistency between the findings from different sources testifies to their validity and robustness. Nonetheless, it should be noted that insight from economic operators and citizens was limited by the lack of a public consultation and low response rates to the economic operator survey. Consultation with economic operators was initially to be organised with the public consultation and was later on replaced by a targeted survey. The survey was promoted through the Commission's newsletter and direct mailings to trade organisations in all Member States and participating countries. 43 economic operators took part in it. While not ideal, the survey still provided some useful insight from an otherwise difficult-to-reach group. The majority of survey respondents were businesses (27 out of 43), while the second largest group represented professional services providers (16 out of 42). The remaining respondents are trade/business/professional associations and one public authority (“other”). More than half (22 out of 43) were from large companies of over 250 employees. 27 out of 43 were from organisations that were active in several countries, while only a small share operated in one country only. Given the numbers of responses involved, the consultation results were analysed using qualitative analysis techniques and reported on in narrative form. The rest of this report gives a brief synopsis of the results obtained, which along with evidence from documentary sources were used to inform the findings, conclusions and recommendations of the evaluation. As mentioned above, 30 of 34 participating-country tax administrations responded to the general questionnaire. Respondents painted positive assessment of the programme in terms of the joint actions and training activities supported, as well as management and EU added value. Regarding the joint actions (which can be classified into different types), most of them are indicated to be very useful to the work of the national administrations. Exchange of best practice, networking and cooperation, as well as implementation of EU legislation were some of the main strengths that were reported to be highly appreciated by respondents. Concerning the specific objectives of the programme, most respondents believed that the joint actions contribute to the achievement of these objectives, either to a great extent or to some extent. In terms of areas of improvement, the suggestions provided were mostly of a practical and administrative nature. While training activities (most importantly eLearning modules) were reported as in use to varying degrees, those respondents that did use them reported that they successfully complemented related initiatives at national level. Training activities also helped national administrations use and benefit from European Information Systems, as well as to take a more uniform approach to the application of EU tax law. Criticisms related mainly to language issues (such as translation costs) and the need to keep eLearning modules updated and bug-free. Finally, administrations showed very positive perceptions of the programme’s EU added value. It was considered to provide a unique platform to tackle common problems with officials from other participating countries and build networks and trust, leading to a better and more harmonised implementation of EU legislation. While the 28 Member State administrations have access to and use the IT systems under review, only 14 of them responded to the questionnaire due to the consultation fatigue issues mentioned above. Although this limits the generalisability of the results, they are broadly consistent with the findings from other evaluation tools. The questionnaire responses indicated an overall satisfaction with the IT systems supported by the Programme, their usefulness and appropriateness for the work of the national tax administrations. Very few respondents expressed a lack of satisfaction with the IT systems, though there were some systems that several respondents were less familiar with or did not have an opinion about. The systems were judged as making it easier to share information quickly and safely, facilitating cooperation and thereby helping to implement EU legislation and fight tax fraud, tax evasion and aggressive tax planning. Regarding whether the systems complement or duplicate other systems developed by the national administrations or other organisations, there was an overall agreement among the respondents that this is not the case. The systems were rather said to rather complement each other, adding value and leading to improvements in existing systems. Despite some costs associated with the implementation of new systems, respondents also felt that the supported IT systems helped reduce costs for national administrations overall by simplifying processes and making it easier to share information. Ideas for potential improvements focused on interoperability, reusability, efficiency and simplification. The evaluation included interviews with 29 programme managers, mostly representing European Commission services involved with the programme but also national coordinators in seven countries (making for eight interviewees, since responsibility for the programme is split in some countries). The interviews fed into the broader assessment of the efficiency of programme management. This found that the design and management of the programme reflect its long-standing success and ability to get better over time, with key features that are appropriate and being gradually improved, leading to a high degree of efficiency. While there was some criticism, this was minor and related to such aspects as making the programme’s monitoring system less complicated and burdensome and making IT tools for reporting and information-sharing more user-friendly. A major part of the evaluation consisted of case studies on seven of the projects defined as priorities in the Annual Work Programmes. These covered a range of the IT systems which receive the lion’s share of programme funding as well as collaboration fora for different tax policy areas, training activities and more practical cooperation between tax officials. The case studies were based on fieldwork in seven participating countries (i.e. the Czech Republic, Germany, Italy, Latvia, Portugal, Serbia and Sweden) and informed by 87 interviews within national tax administrations as well as responsible officials from the European Commission. Each case study led to the production of an individual case study report, which in turn fed into the assessment of all five evaluation criteria. The case studies accounted for a large proportion of the research and as such their findings are reflected strongly in the findings of the evaluation as a whole. These were very positive, confirming the programme’s relevance, describing its effectiveness both in operational terms and contributions to higher-level objectives and demonstrating efficiency and coherence. By allowing participating countries to pool resources, offer solutions for problems with an EU dimension and exchange information, the programme was also found to provide clear EU added value. Within this overall picture of success, criticism focused mainly on gradual improvements that would ensure all activities are relevant and improve operational efficiency. As mentioned above, despite ample promotion it was only possible to elicit responses from 43 economic operators, of which 27 described themselves as businesses, 16 as professional services providers, two as trade / business / professional association and one ticking an ‘other’ box. The majority of responses came from the UK, the Netherlands, Germany and Spain. The responses are thus not in any way representative of economic operators in general or participants / users in the programme, but rather give a snapshot of the views of some individual stakeholders. While only half of respondents were aware of the Fiscalis 2020 programme, all felt that tax fraud, tax evasion and aggressive tax planning to be important issues facing society, along with double taxation and distortions to competition. Collaboration at EU level between national tax administrations was also considered vital. Most respondents also expressed a need to make it easier to deal with tax matters involving more than one EU Member State. Much of the survey focused on the publicly available IT systems and eLearning modules. Though many respondents had not heard of specific systems or modules, when views were provided there were generally positive and indicated that the programme helps economic operators save time and find important information on e.g. VAT rules. Indeed, suggestions for improvements centred on providing more detailed information on VAT and how it differs across Member States. The overall approach to the mid-term evaluation can be classified as theory-based evaluation. That means using the intervention logic defined for the Fiscalis 2020 programme in the Performance Monitoring Framework (PMF) documentation (see Figure 7 below). Theory-based approach implies examination of the causal mechanisms in which the programme was expected to generate the desired results and impacts through collection of evidence to test the initial theory. Such approach allows to confirm (or not) the supposed causality and understand how and why these mechanisms led to expected or observed results. In doing so, the evaluation seeks to identify and assess the extent to which external factors might have hindered or supported the process. In the context of a cooperation programme such as Fiscalis 2020, which often plays a supportive role in implementation of EU policies and priorities, this approach seemed particularly suited. Not least due to inherent difficulties of attributing measurable results to the functioning of the programme. The evaluation followed a mixed-methods approach, featuring a range of tailored and targeted techniques and tools. They have been designed and deployed in a way that was deemed to bring the most value to the analysis. The target-and-tailor principle applied to not only choosing which stakeholders to engage with, but how to reach them, what to ask them, how to analyse the resultant data robustly as well as how to make recommendations that fit with the room for manoeuvre of the Commission and other key stakeholders. The data collection tools sought to probe views and experiences of stakeholders and key audiences, including tax administrations in general, participants in joint actions, economic operators and the European Commission. The information thus collected was cross-referenced with the rich – if not always complete - dataset from the performance measurement framework. The approach built on three distinct pillars allowing to examine the programme from different angles and levels of detail, as well as engaging with different groups of stakeholders. The diagram below depicts the pillars and conceptualises how they fit together. ·national authorities’ questionnaire composed of two written questionnaires (one general on joint actions, training and programme management, the other on IT systems) distributed to the relevant authorities from participating countries. They intended to gather quantitative and qualitative information that was available neither from the framework and tools used to feed into it nor other evaluation methods. Examples include user experiences with specific IT systems, contribution of programme to the work of administrations, views on new types of joint actions, perceived costs and benefits of participating in the programme, management practices, the framework and its processes, management and knowledge-sharing of IT tools and implementation of recommendations from the previous evaluation. ·programme manager interviews consistent of a set of 20 interviews with managers from the Commission and national administrations, allowing to collect experiences, opinions, perceptions and suggestions regarding a range of issues that would be difficult to obtain using other means. These included matters such as responsiveness of the programmes to emerging needs and priorities, organisational and governance structures and processes, the implementation of the performance measurement framework, and such issues as change in programme performance over time, and barriers to the success of the programmes. Thematic case studies are in-depth qualitative research around agreed topics (Annual Work Programme projects) stemming from the need to complement quantifiable data with method better suited to capture benefits linked to support provided for administrations in carrying out functions required by EU and national legislation and boosting capacity. The purpose of the case studies was to examine in detail how given programme outputs were used in practice by administrations and, where applicable, economic operators. The themes were selected upon a review of AWP projects, deemed particularly salient within the programme’s timeframe. Each theme included a series of two or three specific programme actions in seven case study countries (Czech Republic, Germany Italy, Latvia, Portugal, Serbia and Sweden). The joint actions selected were then complemented by information on the main relevant IT systems. The research drew on a review of relevant documentation and face-to-face interviews with 10-12 relevant stakeholders within national administrations in the selected countries (in total 87 stakeholders within national administrations were interviewed as part of the evaluation exercise). Engagement with economic operators took form of short targeted survey. The economic operators are not the programme’s main beneficiaries but it was deemed that their views were important as taxpayers and users of certain IT systems and eLearning modules. The survey included a range of questions on the relevance of the programme’s objectives and activities and respondents’ experiences with several publicly available IT systems and eLearning modules. The survey was promoted through the Commission's newsletter and direct mailings to trade organisations in all Member States. The survey received 43 responses, providing some useful insight from an otherwise difficult-to-reach group. ·Workshops on more theoretical or general matters were not viewed as favourably as ones with concrete, practical themes. ·Candidate and potential candidate countries consistently asked to be invited to more seminars and workshops. ·The usefulness of project groups relies on the expertise and engagement of participants. Some project groups were undermined because MS did not send the most appropriate officials, or allow for enough time to engage outside of official meetings. ·Short summary reports at the end of project groups could avoid the risk of knowledge getting lost. ·Language issues (particularly low levels of English) were seen as a barrier for some officials to conducting multilateral controls beyond neighbouring countries where links are already strong. ·The usefulness of visits was related to the level of effort put into defining a topic and engaging with the work. Some visits were seen as too unfocussed, thereby failing to add much value. ·Awareness and use of PAOEs still low despite satisfaction of countries that have used them, indicating a need for more communication efforts. ·Unique forum for bottom-up collaboration on topics of mutual interest. The figures reflect total instances of participation, that is, the amount of times someone from a participating country participated in an action. (9) It should be noted that prior to the introduction of eForms, the exchanges between national administrations were done on paper, via post. (11) Since the data count individuals who participated in more than one joint action event (e.g. two meetings of a project group) separately, reference will be made to ‘participations’ rather than the number of individuals who have participated in the joint actions. (14) CIRCABC is an open-source, web-based application used to create collaborative workspaces where communities of users can work together and share information and resources. (15) This is the cost per activity, not for the event, which covers the whole duration of the project group. This is valid for the other type of joint actions as well. (17) The definition of critical mass would depend on the specific case and could be determined using a cost-benefit analysis. (19) The Strategic Plan for 2016-2020 can be found here . (20) Commission staff working document, Ex-ante evaluation accompanying the proposal for a Regulation of the European Parliament and of the Council establishing the ‘Fiscalis’ programme for cooperation in the field of taxation. 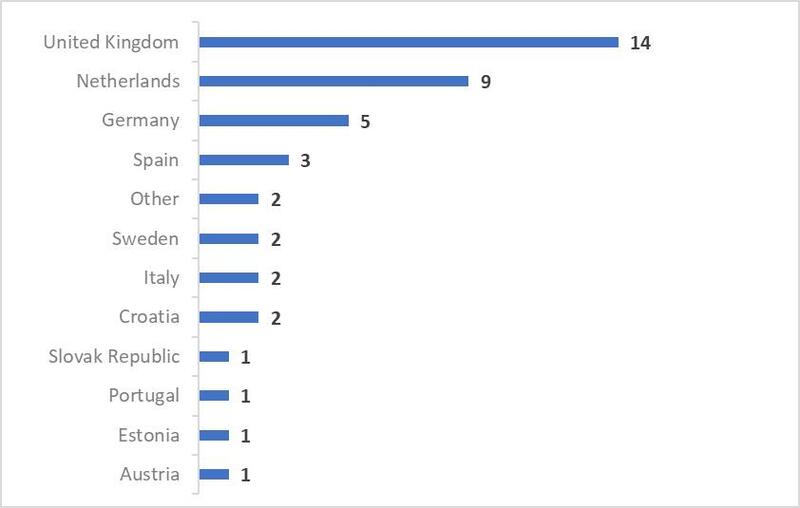 (22) Since only EU Member States can use the majority of IT systems, it was only distributed to the 28 Member States rather than all Fiscalis 2020 participating countries. (23) Note that some individuals provided feedback for more than one case study and are thus counted more than once. (24) Administrative cooperation actions included in the charts refer to selection meetings in which the participating countries meet to explore the usefulness of initiating PAOE / MLC actions in a certain area.